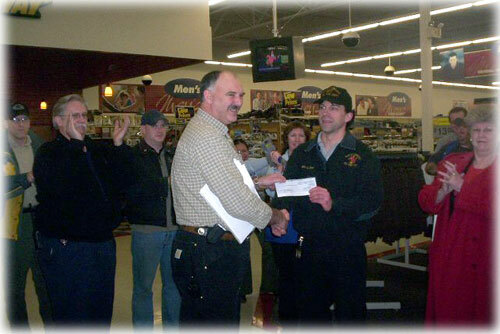 Ketchikan, Alaska - South Tongass Volunteer Fire Department was awarded $7,500 from Ketchikan's Wal-Mart for Advanced Life Support equipment on Tuesday. According to Chief Scott R. Davis, these funds will make it possible to purchase 12-lead monitoring equipment for the department. This type of EKG monitoring enables early recognition of a myocardial infarction (heart attack). STVFD Chief Davis a check for $7,500. life-threatening rhythm and alert emergency personnel at KGH for treatment. In addition, any life-threatening rhythm can be transmitted via facsimile to KGH through any phone line." "This department extends its most sincere and heart-felt "Thank You" to Karen and Terry of the Ketchikan Wal-Mart, Ketchikan Associates and to Wal-Mart for providing this piece of life-saving equipment for our department!," said Chief Davis. South Tongass Volunteer Fire Department's Chief Davis has been involved in fire and EMS services for the past 20 years in Ketchikan.